Kimi took Mongo to the park over the weekend. She did not take him to the big park in the mountains or the big park by the water. She took him to the little park in the woods. Mongo loves going to the woods. There are lots of sticks in the woods. Kimi and Mongo walked down the narrow path into the rainforest. On either side of them were fern beds and towering evergreens of the old growth forest. Sunlight barely filtered to the path. The leaves of the ferns were wet. The evergreens dripped water in big fat drops all around them. Mongo found a stick. It was a wonderful stick. It was a very heavy, mostly because it was waterlogged. He ran up to Kimi to show her the magnificent stick. As he raced past her, he whacked Kimi’s ankle with the heavy stick. Kimi hollered. Mongo turned to see what was the matter. As he turned, he tripped Kimi with the other end of the stick. Kimi howled as she hit the ground. Mongo was worried for his hiking buddy. He turned again to see what was wrong with Kimi. As he turned he beaned her in the head with the big wet stick. This time Mongo got yelled at. He was very sorry, and he did not feel happy at all on the way back to the Jeep. When he got home. He was so sorry, he carried Kimi’s shoes around for her. 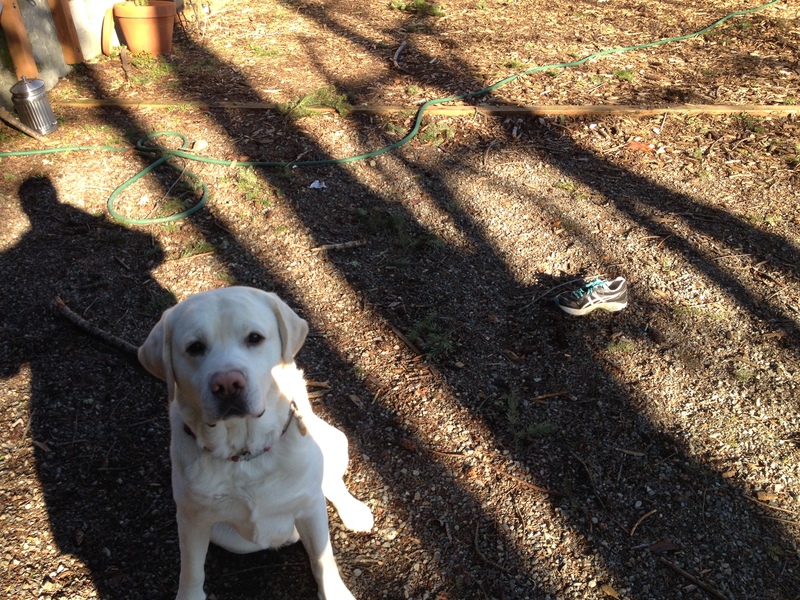 (He left them outside which did not make Kimi any happier.) It was just not Mongo’s day to make Kimi happy. There are studies that say that dogs can develop reasoning powers on a par with a human toddler. And retrievers, i.e. Mongo, are near the head of the class. Animal psychologists say dogs like Mongo can understand up to 250 words and gestures. Mongo knows quite a few words, and some of his favorites are: FOOD, NOM, EAT, PUPPY, PAPER, and PARK. He has learned fairly complex behaviors such as getting the paper, finding and retrieving birds, and bringing Kimi’s slippers outside. In other aspects of behavior, Mongo certainly mimics human behavior. In particular, he mimics toddler behavior pretty well. He routinely digs in his toy box to find a particular favorite, while flinging everything else on the floor. And he never picks them back up. That certainly sounds like toddler behavior. “Well, it was right here on the table, and now I can find it, and somebody must have moved it because it didn’t just get up and fly away.” Dad and Drewbie shrugged their shoulders, turned back to the car and continued loading. A few minutes later, Mom-mom appeared at the back door laughing so hard she could hardly speak. “I found it!”, she exclaimed between peals of laughter. “He took it off the table and hid it in his toy box!” This is the one example of him ever putting something in the toy box. It can only be surmised that this most valuable of prizes was worthy of being placed in his safest place. Another example of intelligent behavior is at the end of the day. Since Drewbie moved out, Mongo has a queen sized bed all to himself. But dogs are social animals and sometimes having a bed to yourself is not a desired situation. Mongo knows he’s not allowed in Dad’s bed and never jumps up on it, at least not while Dad is watching. And at the end of the day, Dad closes the door to his bedroom to keep Mongo out, so that Mongo can’t wake Dad up at 3:30 a.m. for early breakfast. This is an example of learned behavior on Dad’s part. Typically, Mongo is already on his bed by the time Dad closes the bedroom door. However, on certain rare evenings, the routine changes. Mongo flops down on the floor in Dad’s room and refuses to leave. This typically occurs on unique evenings, like the first night after Drewbie goes back on the road, or if there is particularly loud storm outside. Last week, there was a very loud storm outside with winds up to 50 mph. Mongo planted himself on the floor in Dad’s room. Dad came out of the bathroom and saw him flat on the floor. “What is it Buddy?” Dad asked. Mongo did not move. “Do you want me to follow you?” Mongo looked at the doorway. “OK, I’ll come with you then.” Dad moved to the doorway and Mongo sprung up from the floor. It is on these rare nights that Mongo does not turn left and race down the stairs to the “cookie box” (actually his pet box, where he often receives treats) for one more EAT. Instead, he darted towards Drewbie’s room, stopped at the door, and looked back at Dad. Dad followed him. Then Mongo jumped on the bed, turned and looked back at Dad again. “I’m right behind you Buddy.” Dad sat on the bed, and asked Mongo, “Is the storm making you nervous? Do you need someone to lay down with you for a minute?” Mongo flopped on the bed. Dad laid down next to him and scratched Mongo’s ears for a little while until Mongo rolled on his back and began to snore. Then Dad went back to his own room. Whatever the canine reasoning behind this particular behavior, it certainly calls to mind having to tuck in a nervous toddler on a loud stormy night. Another trip without the fuzzy buddy was Detroit. 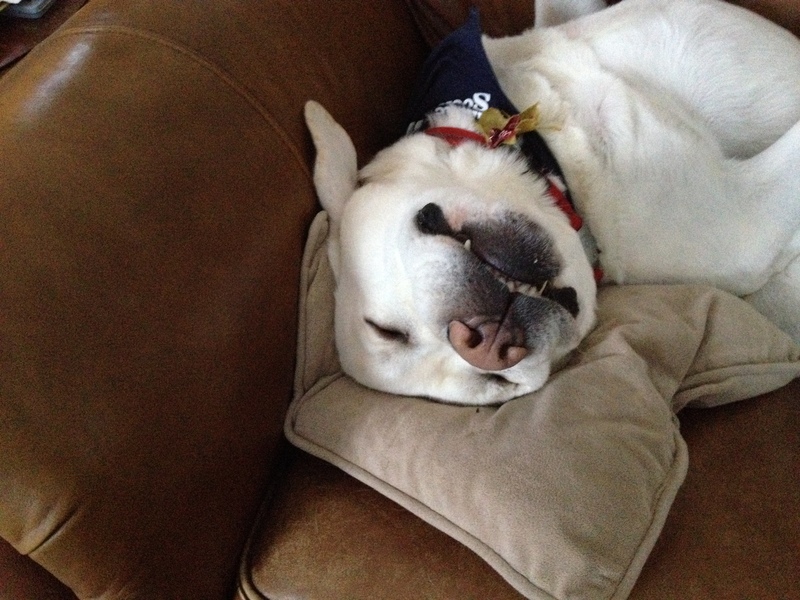 Dad went on a trip to see the Red Wings hockey team play, and Mongo would not have enjoyed it much. Especially since there is not much greenery in downtown Detroit at this time of year, and Mongo loves the green of Seattle. But the lack of greenery did not mean there was a lack of bright colors. Dad and the hockey crew were standing outside at the Greektown Hotel and Casino and the crew were debating whether to take a cab or the Detroit People Mover (DPM). There was an animated discussion in process regarding the wait time for a cab vs. the fact that the team did not know where to pick up the DPM in Greektown. Just then, a garishly spray painted school bus turned the corner towards them. On the side it said “Ouzo Cruizo”. Dad piped up, “Let’s take the bus!”, and hopped on. The crew stared at the surreal sight for a moment, and then piled on after assuring themselves that this was a free bus, and that yes it was going to the Joe Louis Arena. Dad never doubted. After all, considering all the infinite improbabilities in the world, and the fact that Dad himself is remarkably improbable, why wouldn’t a free garishly painted school bus appear to take him to the hockey arena precisely when he needed it? 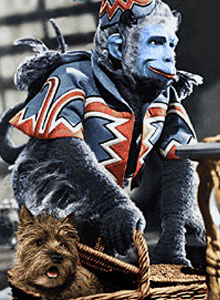 It really was the flying monkeys! Honest! Mongo was caught with the remains of a scarecrow in his mouth. If he could have talked, I am certain that he would have explained that he was just rescuing the poor scarecrow. It was really the flying monkeys that had torn Scarecrow apart.